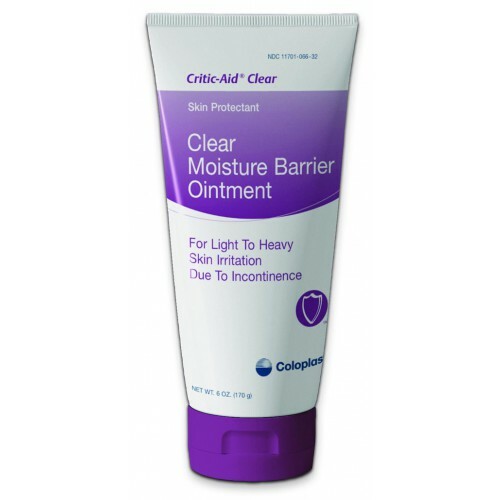 Critic-Aid Clear Barrier Ointment, manufactured by, Coloplast helps heal damaged, denuded skin caused by incontinence, diaper rash and other skin irritations. Diaper rash is a very common condition that can occur from the use of incontinence diapers. This condition can also occur from instances involving moisture being on the skin for too long. Diaper rash is most commonly caused by friction against wet diapers and results with redness, pain, and skin irritation. Also known as denuded skin, left untreated it can develop into painful blistering, and more serious fungus related infections. An excellent remedy to this common condition is cleaning the area with a skin cleanser and applying a moisture barrier ointment to keep the area dry. Critic-Aid Barrier Ointment is available for sale at Vitality Medical and is designed to provide a moisture barrier helping to prevent skin irritation and inflammation. This product is easy to apply and contains minimal ingredients so there is less worry of possible allergic reactions. Adheres to intact and denuded skin making skin irritation and inflamations more manageable while allowing the skin to heal. Prompt treatment and use of barrier creams for diaper rash and skin irritations can help with keeping the skin clean, dry and protected. Another great feature of the Critic-Aid Barrier Ointment is the clear formula hat allows you to assess the condition of the skin while the ointment is in place. This is esspecially useful for skin conditions where wiping would be painful. According to Coloplast this ointment is suitable for neonatal use and is CHG compatible. BUY Critic-Aid Barrier Ointment from Vitality Medical today. Does this product burn or sting if the area is already inflamed and irritated? I'm looking for something for my 19 year old son he is 6'6" tall & weighs 225lbs. He tends to sweat a lot from his belly button down to his mid-thigh area. Any suggestions?? The manufacturer states the ingredients on the item are not meant to further irritate the affected area; however, it's best to contact the manufacturer for a more precise answer. the product is good, Ilex is better. Although caregivers prefer an over-the-counter brand ointment with more zinc, this oinment provides a wonderful coverage for its healing properties. The caregivers apply it for overnight use. As a nurse, we know that patients with urine incontinence and frequent defecation of liquid stools greatly affect the integrity of their skin. Using CriticAid Clear Moisture Barrier Ointment made us all agree of its benefits. It is easy to remove and it adheres well in place without causing injury to the tender skin.